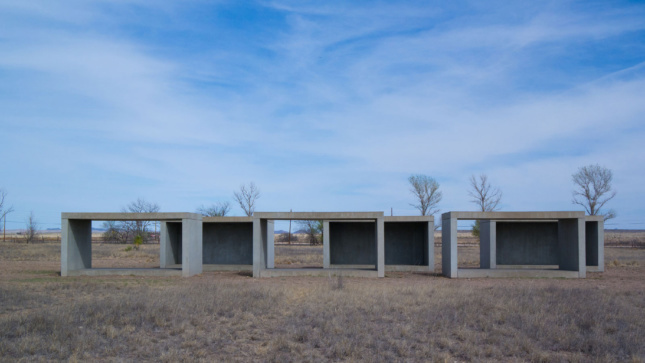 Opening Tuesday, November 14th at the Center for Architecture, Obdurate Space: Architecture of Donald Judd brings both the built and never-realized works of Donald Judd to the forefront. A master minimalist of the late 20th century known for his prolific sculpture and furniture design, Judd’s architectural work demonstrates his consistency when working across a multitude of scales. Curated and designed by Claude Armstrong and Donna Cohen, who served as architectural assistants to Judd in the 1980’s, the show will highlight what he called the “fundamental realities, space, material, and color, shared by art and architecture.” From 1984 until his death in 1994, Judd was actively involved with projects around the world, sometimes juggling up to 19 at a time while still producing a wide body of art. Obdurate Space will exhibit five Judd works that highlight his commitment to context and awareness of the interplay between architecture and sculptural form: the Concrete Buildings in Marfa, Texas; the urban proposal for downtown Cleveland, Ohio; the Eichholteren Haus in Küssnacht-am-Rigi, Switzerland; the Kunsthaus Bregenz Office and Archive Building in Bregenz, Austria; and Bahnhof Ost in Basel, Switzerland. Putting models built specifically for the show, photographs, drawings and renderings on display will allow visitors to experience Judd’s un-built projects with a new level of depth. Prominently working in both New York and Marfa, Texas, Judd’s former studios themselves have become extensions of the art housed within. 101 Spring Street in Manhattan, a cast-iron building purchased by Judd in 1968, was recently restored by the Judd Foundation to the original open floor plan studio as a revolving exhibition space. In Marfa, the Foundation’s properties are a sprawling collection of realized projects, art galleries and collaborative collections that blend art and the built environment. As this is the first show to focus solely on Judd’s architecture, curators hope that the exhibition will bring wider public recognition to his lesser-known body of work. “Our motivation for the exhibition, for the observations here, together with new models, drawings, and project descriptions, is to share Judd’s work in architecture with a wider public and to connect that moment to the present,” said Donna Cohen. Obdurate Space: Architecture of Donald Judd will be on view from Tuesday, November 14th with a reception from 6:00 – 8:00 pm, and close Monday, March 5th, 2018. More information can be found here.